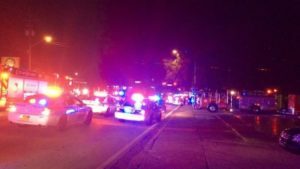 At least 20 people have been killed and some 42 injured in a shooting at a gay nightclub in Orlando, Florida, police say. 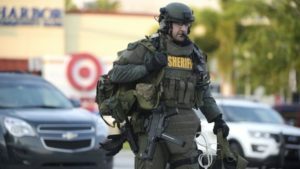 Orlando Police said officers entered the Pulse Club about three hours after the shooting unfolded – and killed the gunman, who had taken hostages. They called it an act of terrorism, but said they did not yet know if it was domestic or international. Relatives have been gathering at local hospitals desperate for news. Many had received calls and texts from loved ones inside the club as the siege began, and some have heard nothing since. After this a “hostage situation” unfolded, he said. “Our SWAT officers exchanged gunfire with the suspect, the suspect is dead,” he said. An FBI spokesman said they were investigating whether the attacker was a “lone wolf”. He said the attacker appeared to “have leanings towards” radical Islamist ideology but it was not yet clear whether this was a case of domestic or international terrorism. At least 20 bodies have been found in the club itself, and some 42 people have been taken to hospital to be treated for their injuries, Chief Mina said. A clubber earlier described a situation of chaos outside as the number of casualties became apparent. 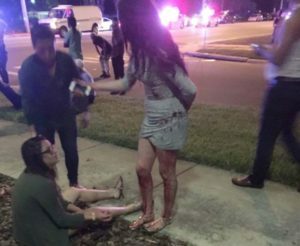 Some of the injured were reportedly brought to the Orlando Regional Medical Center in police pick-ups. More than 100 people were reported to have been enjoying the end of a Latin-themed night in the club, which calls itself the hottest gay bar in the city, when the attack began. “We heard rapid fire go off. In the room I was in, people went down to the floor. I wasn’t able to see the shooter or people get hurt,” Ricardo Negron Almodovar told BBC News. She had been signing autographs when she was shot by 26-year-old Kevin James Loibl, who then killed himself. It is not clear what Loibl’s motive was.